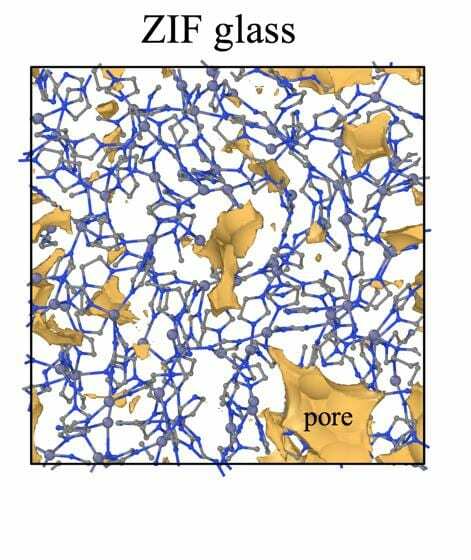 ZIF glasses, a new family of glass, could combine the transparency of silicate glass with the nonbrittle quality of metallic glass, according to researchers at Penn State and Cambridge University in the U.K. The newest class of glass-forming materials, zeolitic imidazolate frameworks (ZIF), has a structure in which metal ions are linked by organic ligands. When heated within a limited range of high temperatures, some ZIF materials will melt and reform into a glassy structure in which the atoms have a disordered structure. Beyond the potential of a transparent and far more bendable glass, some ZIFs contain large numbers of functional pores that can be used for gas storage — metal-organic frameworks have been proposed as cages for hydrogen storage for fuel cell vehicles, catalysis, gas separation or even drug delivery. In two recent journal articles, Mauro and colleagues used different modeling methods to deepen understanding and predict the properties of ZIF glasses. The first modeling method, ReaxFF, was developed by Adri van Duin, professor of mechanical engineering at Penn State, who is co-author of both papers. ReaxFF is a computationally fast and economical method for simulating the melting and reforming of candidate materials. Yang added that using ReaxFF cuts the time required to perform simulations to a few hours rather than the several days it would have taken using quantum mechanics methods. In the most recent paper, published in the Journal of Physical Chemistry Letters, the researchers used another modeling method originally developed for another class of glasses called chalcogenide glasses. “James Phillips proposed that we can think about glasses in the same way a civil engineer would think about designing a truss structure like in a bridge or the Eiffel Tower,” Mauro said. Phillips, who was at Bell Labs at the time and is now at Rutgers University, proposed a method to optimize glass based on the degrees of freedom of the atoms compared to the number of rigid bonds to other atoms. When the bonds equal the degrees of freedom — the ability to move up, down or sideways — the system is usually in the optimal state to form a stable glass. Mauro, who was at Corning Incorporated, and Prabhat Gupta, of Ohio State, extended the theory to develop what is called Temperature Dependent Constraint Theory, which accounts for bond breaking at high temperature, and also extended the theory to make quantitative predictions of glass properties. Although their theory, formulated in 2008, has been applied successfully to many oxide glass systems and used in the formulation of industrial glass compositions, this paper is the first time it has been applied to the ZIF metal-organic glass system. Thomas Bennett at Cambridge University is leading the experimental portion of the work, including the synthesis of ZIF samples, which are currently only millimeters in size. Additional authors on the recent paper, titled “Prediction of the Glass Transition Temperatures of Zeolitic Imidazolate Glasses through Topological Constraint Theory,” are Mauro’s doctoral students Collin Wilkinson, Kuo-Hao Lee and Karan Doss; Adri van Duin and Yun Kyung Shin, an associate research professor in van Duin’s group, and Thomas D. Bennett, Royal Society University Research Fellow at Cambridge University. The Institute for CyberScience at Penn State and the Royal Society, U. K, funded this work.